Take BrainControl for example - an Italian company that has created a way for people to control external devices with their thoughts. This tech is specifically aimed at those suffering from pathologies like Amyotrophic Lateral Sclerosis, Multiple Sclerosis and other neurological conditions. The chemical interaction between the billions of neurons in your brain creates masses of electrical impulses, all of which are monitored by the Brain Control Interface. Certain signals correspond with specific brain activity, such as movement, and though the device needs to be calibrated for different users, the patterns are very similar between different people. 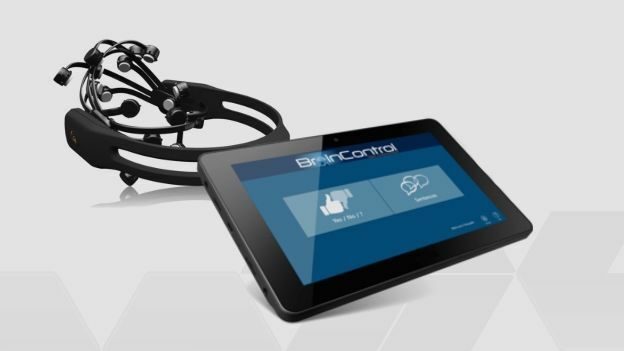 Simply put - BrainControl's technology can detect the electrical activity of thoughts related to movement, and communicate that to operate other devices. Even more simple - control stuff with your brain. Which is utterly amazing. Representing the UK meanwhile, is smart-home start-up Cocoon. Home security tech is nothing new, but Cocoon's tech brings something new to the table to overcome the usual hurdles such as hyperactive pets and loud children, both of whom have a habit of setting off over-twitchy cameras and sensors. Firstly, Cocoon learns what is normal activity and what isn't in your house. It's armed with a bevy of sensors, including motion detector, microphone and HD camera, and it builds data on who belongs in the house and the normal activity levels when you're in or out. It even learns your routines to protect when you're away or asleep. The killer feature though is 'Subsound' - that lets Cocoon sense activity in your whole home, no matter where you put it. It's similar tech to that used in earthquake early-warning systems, detecting incredibly low-frequency vibrations that come through walls and floors. Cocoon distinguishes those that are unusual for your home and then alerts you via an app. Finally, courtesy of the Netherlands we have Greeniant, which lacks the same wow-factor as the other two, but more than makes up for that with its utility. Greeniant analyses and pulls together data from smart home meters. Rather than giving you flat data, it actually deaggregates everything to tell you exactly how much energy each appliance in your home is using, how much everything is costing you and even how it affects your carbon footprint if you're into that sort of thing. This means you can identify the high consumption devices in your home to adjust your usage and start saving money straight away. And because it uses data from smart meters, it doesn't require any additional devices - no plugs or dongles, it just works straight away. Perhaps best of all, all three of these companies are the latest to be backed by London-based 'incubator' - read: investor - Breed Reply, who have a good track record with this sort of thing, having already invested in solid projects like Sensoria Fitness and Xmetrics. We just had a thought - Tech Eurovision! Anyone? No? You sir? No? Okay.